Hi everyone Deb here with an update and a review of our newest product from Jerdon. It's great to have a new model onboard although it will not be available for another 4 weeks. It will bring a different type of magnifying mirror into consideration. This model has a large lighted non magnified surface to use and then for the delicate eye work the adjustable 10x spot mirror comes into play. New for Australia from Jerdon the simple elegantly styled JS811W is a mirror unlike anything we have in our current lineup. The two most notable things about this mirror when you see it for the first time is the size and the movable spot mirror. The actual mirror dimensions are 20cm wide by 27cm high with spot mirror being 7.5cm in diameter. This size makes it a breeze to use and easy to walk around the house for a good natural light location. LED lighted and using just 4 AA batteries make this the perfect mirror to use almost anywhere. Easy to travel with by folding it down and packs nicely into your suitcase. Sometimes the natural light is the best for using the mirror; so on those bright days natural light and when inside or it's darker then use the LED Lights. Whilst the big mirror is not magnified but importantly it is lighted with the size being just right. Adjust the spot mirror with 10x magnification now allows you to get your eye makeup just right. The spot mirror can move up and down and side to side or when you're finished with it can fold around the back out of the way. You will also notice the embedded LED globes in the mirror distribute the light evenly to give a bright clean reflection. The on off switch is located on the back of the mirror to give the front that clean look. The LED globes are cool to touch so there are no hot surfaces to worry about. You may already know that LED lights use very little power and so that means gentle usage on the batteries that will last a long time. The main body of the mirror will also tilt on the stand plus Jerdon have provided a handy tray for your tweezers or make brush and products to sit in. Of course we know that Jerdon Style has earned a reputation for excellence in the beauty industry with its broad range of travel, wall and vanity style cosmetic mirrors. Jerdon has been a leading provider to the finest hotels, resorts, cruise ships and spas worldwide and continues to evolve with and shape how stylists envision beauty and fashion. Just a quick stock update we are currently missing some product lines from the site as you know when we are out of stock we prefer to remove from view to help you avoid disappointment by paying and then finding no stock available. We expect to receive more stock over the coming weeks and they will reappear on the site so keep your eyes open. The direct wired models will be the first back in stock the HL8 and HL85 and we expect the LED110 out portable 10x magnification lighted power suction soon after. As soon as they get close they will appear back in the shop. Hi everyone something a little different today about magnifying mirrors from our Phone support staff. They reveal some of the feedback when talking with our customers these last few months and well worth relating here in this post today. The one comment that shows up is "gee you're expensive" when we look at the other online shops. It becomes apparent very quickly after talking through with the caller about what they looked at, they have missed some vital considerations. Things like will the lighted magnifying mirror even work in this country? Is it in stock? Who do I call if I have a problem? How good is the quality? How long does it take before I receive it? Generally we remind them the price for our magnifying mirrors is all inclusive meaning the product, packing posting/shipping and GST with nothing extra to pay. As the conversation goes along there are some vital points being missed. Many people don't realise they are on an American site so prices are in US dollars. Worse still if they want to purchase a Lighted mirror there is a plethora of American and Chinese sites that sell only mirrors made with 110 volt wiring. MHB lighted mirrors have all been made especially for Australia who has 240 volts of power coming through the power point. With that many people never check that the mirror is 240 volt and some do buy the cheaper 110 volt model and use a converter and wonder why the mirror burns out or catches fire. Twice the amount of power going through any electrical device always leads to a disaster. Sites like eBay and Fishpond are notorious for selling incorrect electrical models for Australia. Both have warnings but still allow them to be listed and sold with many sellers generally uncontactable over the phone. Price is certainly not everything however it is a very strong lure. 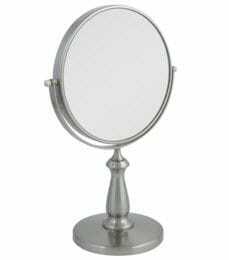 My Health and Beauty has a collection magnifying mirror models sourced and specified from the best manufactures all in the one location and we actually hold the stock in a warehouse. If you saw a particular model in our online shop when you were browsing and it no longer appears then we are out of stock and it will reappear when goods are back in the warehouse ready for dispatch. Unlike many online stores that do leave their stock online and allow the transaction to go through will take your money and then send an email saying it's out of stock but it will be in soon. This type of transaction is an inconvenience and a disappointment to you. The irony of all of this how many of those online stores display a phone number where you can pick up the phone and ask a question immediately with someone who sources, tests and trial every model. Even if you can find a number to ring you likely get a person on the other end that has no idea. 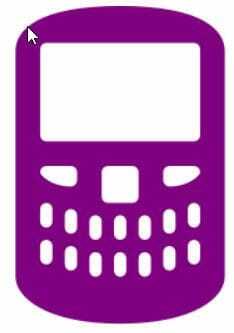 With My Health and Beauty our phone people can handle every enquiry. Things like advice on what magnification may work for a person, anything about any model from a dimension to its color. Perhaps there is a problem, not able to use the website to buy, spare part needed and much more. Our strongest quality is being as fast as we can to get the order out. We believe when you buy you should have the goods in your hand as quick as possible. Hence if we receive and order before 1.30pm then goods get express posted on the same day as purchase. I hope thats helpful information for you and most importantly it goes for many purchases online not just magnifying mirrors. Best Lighted Compact Magnifying Mirror. 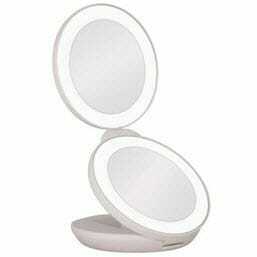 At last the best lighted compact magnifying mirror is back in stock. When we originally started out with these we thought they would only work best for the professional people who travel between appointments and need to look their best before going into the boardroom. It seems there are many who do want to use something better than the tiny compacts you see around they have found the LEDT01 to be the perfect companion. All compact magnifying mirrors have their own unique uses and the first thing that comes to mind is you really need at least two magnifying makeup mirrors. One that stays in the bathroom and one that can go with you either when you're travelling or just a daily use model in your purse. When out travelling, shopping or racing from meeting to meeting a lighted makeup mirror is indispensable. This the lightest and most compact of our range is the LEDT01 . It is just the right size to fit in your handbag and excellent for everyday touchups and can get by as your travel magnifying mirror at a pinch. Weighing in at just 280 grams and folds down completely flat and comes with a lighted fold out arrangement it is also the smallest of the range. Many like something that's bigger than the small compacts available to use and fortunately Zadro has come to the rescue with the LEDT01 lighted makeup mirror. 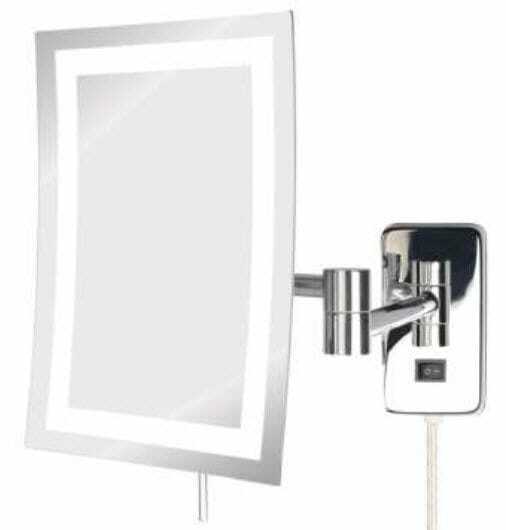 It folds out quickly and easily into many positions, has two LED lighted mirrors one magnified mirror and one not magnified but both have a halo light you can turn on and off individually. Whilst most bathrooms in public buildings have reasonable light it's when you need to dash from the car into a meeting and you need to check you're looking your best this magnifying makeup mirror with lights is at its best. When travelling lighted magnifying mirrors can be a lifesaver when you are away from home. Here at My Health and Beauty we are always on the lookout for a mirror that can be used in any circumstance. The Zadro lighted compact comes very close. 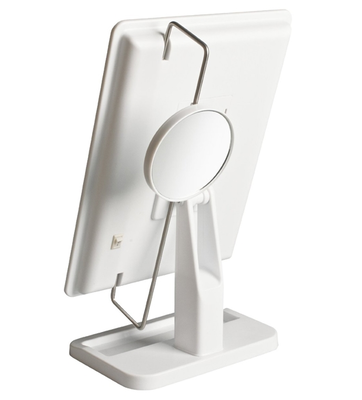 The duel mirror arrangement have a 10x and a 1x magnification allowing close up work or a quick glance overall. Of course this type of magnifying mirror may not suit everybody as some want a bigger size mirror, less magnification, or don't need the lighting. Take the time to have a look through the rest of the range and you may find something that really is the best for you. The Ult110 is very popular as it's just that little bit bigger and folds flat, still has a light and duel mirrors. In the non-lighted range the MC310 and the bigger brother the MC449 also may be better for you. Hope you enjoyed this update and if you have been waiting for this model then I'm glad I was able to give you the good news. Until next time Keep Smiling. Lighted magnifying mirrors have come a long way over the last three years with the introduction of Travel lighted makeup mirrors, LED mirrors both wall mounted and bathroom vanity lighted magnifying,and shaving models. I have put some points together here for your consideration when choosing a lighted magnifying mirror. Lighting in some bathrooms is an issue as the position of the overhead light fittings either throws a shadow over your face or the light bounces of the standard wall mirror found in most bathrooms. Either way it makes it very difficult to do such things as put makeup on, put your contact lenses in or attend to any eyelash issues. With a halo mirror its light reaches every part of your face including under your eyebrows through light coming on the face from every possible angle. If you have a dark bathroom then application of makeup can be difficult, a lighted magnifying mirror can solve this issue. It may surprise you to know there are so many different lighted mirrors available. For portability or travel the lighted mirrors are a new concept which comes with important considerations such as weight, important when traveling considering how airlines are making it mandatory to travel lightly these days. We believe the travel mirror has to be practical also and fold down in to the neatest design or shape to get all the benefits or a small component in your luggage. The lightest and most compact of our range is the LEDT01. It is just the right size to fit in your handbag and excellent for everyday touchups and can get by as your travel magnifying mirror at a pinch. Weighing in at just 280 grams and folds down completely flat comes with a lighted fold out arrangement it is also the smallest of the range. The next and most popular of the lighted magnifying mirror models are the PSC110 power suction mirror weighing in at 300grams. The best thing about this model is that it has a LED light that's very light on batteries and a great size mirror measuring 16.5 cm. Just a perfect size to do everything you want, best of all the easy power suction arrangement a quick twist for on or off the wall makes this a wonderful mirror to use. You can hold it in your hand or wall mount it in seconds. Its does not fold down completely flat as the knuckle on the back of the mirror makes it stand up a little. When I take mine away I wrap it in some soft clothing and place it in a part of my case that's not packed super tight. 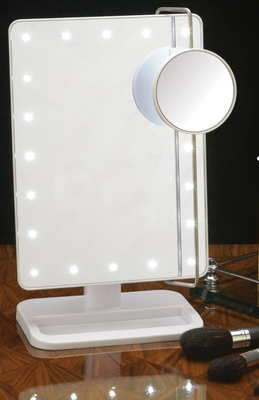 Our final travel lighted magnifying mirror is the ULT111 brand new to the range and is very practical with its two fold out mirrors, they look huge in size at 16cm in diameter, LED halo lighted, a small digital clock in the stand and a new finish for us here in My Health and Beauty that being ivory. Best of all it folds down to just 5cm high and weighs in a 500grams. The mirror then stores in a black velvet carry bag. The bigger magnifying mirrors come in many different formats from LED, Halo lighted, Plug In to direct wired. For those that have not heard of direct wire before it simply means that there is no plug and the mirror has been set up so that your electrician can mount it on the bathroom wall and connect directly to the house wiring. That way you no not have to have a power point and a curly cord as the other models do. I guess it's the minimalist look that some search for these days. It's often found in hotels bathrooms but seems to have made its way of late to new houses that want style and convenience. Our new LED lighted models have proven popular with good sizes, looks and course the latest style. The LED88C has been a longtime coming and 8x magnification works perfectly for those who may wear glasses during the day but need to take them off to apply makeup, remove contact lenses or attend to any eyelid or eyebrow issue. Being double side with the LED halo lighting on both sides it's becomes easy to attend the close up work and turn the mirror over for and overall view. The JRT710 Rectangle LED magnifying mirror looks to be a natural edge style however on looking at the back of the mirror you can soon see how brilliant Jerdon have applied their long term knowhow to this mirror. It is a very solid and built to last magnifying mirror. A wonderful style addition to any bathroom and at 5x magnification just right and very easy to use. The on off switch is situated on the base plate and to have the mirror in any position you desire Jerdon have provided a guiding rod so your hand never needs to touch the mirror. The mirror uses LED globes rated at super long lasting and use very little power. Jerdon have worked extensively to have the LED color become more sympathetic with your complexion. In previous posts many of the LED mirrors available give off a harsh white light and does not show your complexion in the most natural look. It then becomes very easy to apply makeup that's does not work for you at all. Jerdon's HL7 halo series which uses incandescent lighting has been so popular which will show your complexion in the most natural look comes in direct wired format 3x and 5 magnification and Gold or Chrome finish. We must not forget the newest addition from Zadro that being the LEDMW45 Cordless LED Halo lighted wall mount mirror powered by batteries. This solves a problem for those having difficulty putting a magnifying mirror in a bathroom that had a power point in the wrong place. The entry price point for this LED halo lighted mirror is significantly lower than those made for Australian 240volt power. The question on many minds is how long do the batteries last? Well because this mirror uses energy saving LED lighting which consumes 70% less than normal globe mirrors a set of 4 AA batteries will last 2 years. One of the key features of this mirror is the auto off timer which adds convenience and saves your battery power if you walk out and leave the light on. The timer will time out after 5 minutes. And finally not forgetting our shaving mirrors both lighted and great in the shower for that perfect shave requires the perfect conditions. Dermatologists recommend shaving, cleansing, and exfoliating your skin in the shower. The hot water and steam allows your hair and skin to soften so that the razor can shave more efficiently avoiding that painful tugging, pulling, and razor burn. The Z'Fogless Adjustable Magnification LED Lighted Mirror Z850 features a patented hydrophobic coating to repel water and keep it completely fog-free no matter how steamy the environment. Plus, its unique adjustable magnification control cycles between 1X and 5X simply by rotating the mirror head. The 1X magnification is great for all-around viewing needs while the 5X magnification is perfect for getting up close and personal when shaving smaller, sensitive areas of your face. No matter how dim the environment, the LED surround light evenly illuminates your face for a fuller, brighter reflection. Built into this brilliant shower mirror is a place to hang your razor, LCD clock so you're not late for work. Best of all it easily mounts to most any smooth surface via suction cups, hanging cord, or double-sided tape which is included in the mounting kit. It's common to not have a light in the ceiling above the shower so can make it a little dark to see. Zadro have built in 4 bright LED lights powered by 3 AA batteries that light up the entire mirror face, making shaving even easier, no matter your lighting situation. I hope you have enjoyed this reminder of our quality lighted magnifying mirror range and I look forward to bring you news of some exciting new mirrors as they land.